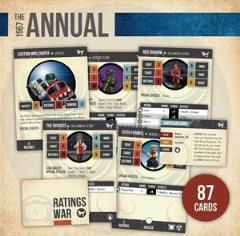 This deck features all 73 new 7TV2 profile cards from the 1967 Annual, as well as 16 half sized cards: the 12 Ratings War cards and 4 Daredevils gadgets. Save yourself the drama of cutting up your book or doing all the printing at home with this expertly printed set of full color cards. This deck also comes with 5 cards for the Paranormal Exterminators 3.